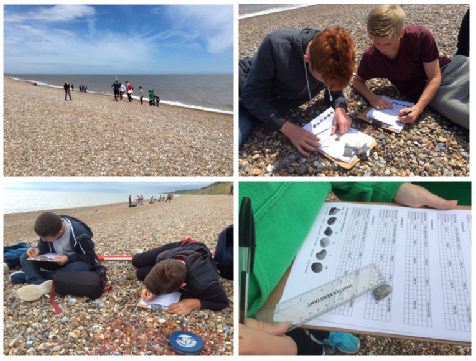 Dunwich and Aldeburgh - Our Year 9 Geographers who are taking GCSE Geography from September visited Aldeburgh and Dunwich in June. The day included studying changes in the beach and coastline along the stretch of the Suffolk coast running from Dunwich to Aldeburgh. The work completed during these days will form the basis of the fieldwork investigation that students will be examined on in their final exam in Year 11. It also underpins the work that students have been looking at this term on coastal erosion and coastal defences. Yr 12 A level - Holkham Bay - Despite very wet weather, our A2 students had a productive day of fieldwork on the sand dunes at Holkham Bay in June collecting data to support their Unit 4 A2 fieldwork investigations exam. Students have been studying plant succession on the sand dunes and have been writing up their findings this term. Year 12 Travel & Tourism visit to Cambridge - Our A'level Travel and Tourism students recently undertook their preliminary research for their investigations into current issues affecting tourism in Cambridge. During the visit they were lucky to interview members of staff at the Tourist Information Office and at Kings College Chapel giving them a great insight into tourism trends across the area. To help contextualise their research they also took a trip on the open-top tourism bus, seeing the sites and identifying the key attractions for their projects. 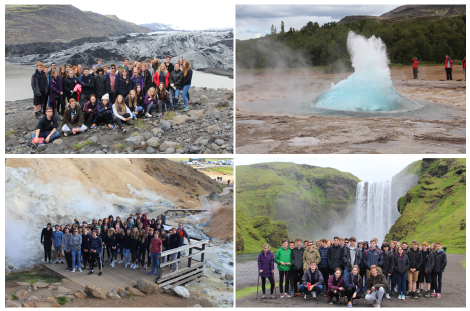 A group of 43 students returned last week from our 10th annual visit to Iceland. We had an amazing trip and it was real a pleasure to take such a fantastic group of students who fully immersed themselves in the whole experience. Over the five days in Iceland students bathed in the Blue Lagoon, walked behind and to the top of majestic waterfalls, marvelled over huge glaciers, visited mud puddles, hot springs and geysirs and walked to the top of the active volcano, Eldfell, which last erupted on the island of Heimaey in 1973. The student adventures along with photographs were documented on our trip blog which can be visited here https://ivoiceland16.wordpress.com. Our popular Iceland visit for our Year 10 Geographers will be running again in July 2017. The visit is open to any of next year's Year 10 Geographers and letters will be available in September. Please note that a £100 deposit will need to be paid by the end of September; further details and a letter will be available at the beginning of the new term. The Geography Department is online at www.geobytes.org.uk and along with our department twitter feed @StIvoGeography and our Department Facebook Page 'St Ivo School Geography Department' has continued to be used regularly throughout the year since its re-launch last September to update students and parents with the work of the department, as well as to share resources and news stories to help students further their interest in the subject. 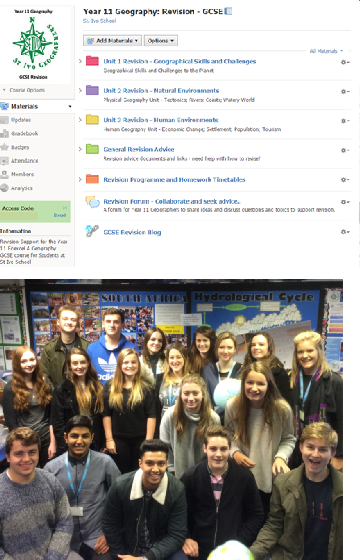 Our GCSE and A'level courses are now also fully online using Schoology.com to provide online support for our students to encourage independent learning and provide access to resources and advice to support them with their work. This has proved successful this year and has been well received by students and we hope to develop this further as we start teaching the new GCSE and A'level specifications for Year 10 and 12 from September 2016. We would like to say thank you to our Sixth Form Geography Ambassadors for all their help and support during the year. The students have helped out with various extra-curricular Geography events and activities including open evenings, training events, Eco-Ivo work, support in KS3 classes and primary liaison activities amongst others. We have had another busy term in the Geography Department following the completion of this year's GCSE and A'level exams. The Geographical Association’ are running a physical geography photo competition. Please see the website or attached document for more details (http://gapgphotocompetition.org.uk/) but in brief, students need to submit a photograph of a physical feature or landform along with a description, enquiry question and possible geographical investigation (maximum of 250 words). The deadline for this competition is Friday 23rd September 2016. Entries need to be submitted online at: http://gapgphotocompetition.org.uk/?page_id=5 although copies should also be sent to Miss Raine (sraine@stivoschool.org) for a department competition. For 'The Royal Geographical Societies' “Young Geographer of the Year” competition - students are asked to explore geographical change from many different perspectives at both local and national scales. Key Stage 3 and 4 students will need to produce an A3 poster and KS5 students need to write a 1500 word essay. The deadline for this competition is 14th October 2016 however work must be submitted to Miss Raine (in N15) by Monday 10th October 2016. Please see the website (http://www.rgs.org/OurWork/Schools/Competitions.htm). Finally we would like to congratulate all of our students on a very successful year in Geography and the Geography Department Team would like to wish you all a very happy summer break!